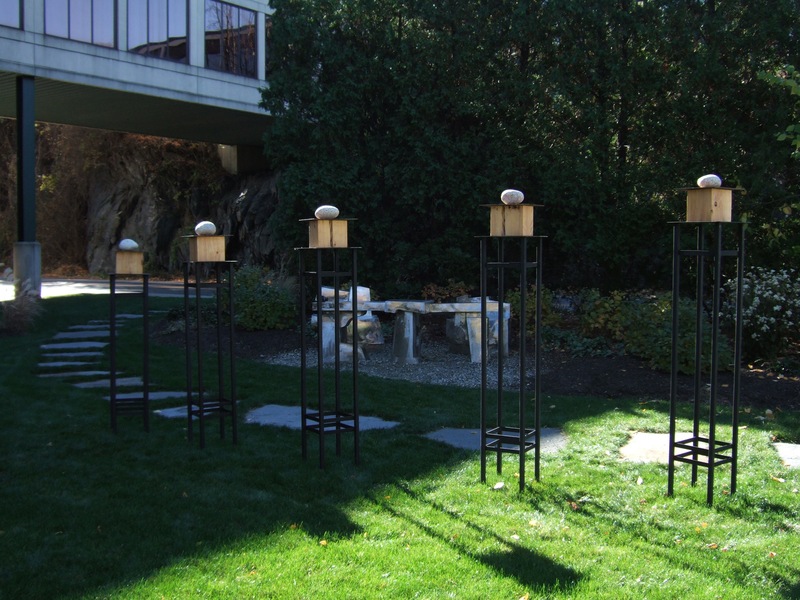 At the request of Curator Mara Williams Oates, we created an additional sculpture (this time for out doors) to add to the Our Fragile Home exhibit for the Brattleboro Museum run (until February 9, 2014. It is titled The Words Were All the Same and makes reference to the fact that space travelers all use the same words to describe the experience of viewing our planet from outer space for the first time…a theme of the exhibit. Notice on the white stones which represent the planets that you can see the “terminator.” That is the fine line that separates day from night as you move across the orb. We believe that if people from greatly different backgrounds, culture, language, religion, and politics can see a stimulus in the same way…in this case as a fragile, valuable object in need of protection…that there is hope that vision and language will help us to address the problems of the world and provide us with a basis for resolving them. We are very excited that after this tour ends in 2014 the exhibit will continue on to Alabama, Arkansas and Texas. And who knows…it may go on from there. Our thanks to everyone who has been so supportive of our efforts. It has definitely been a joint experience!! !